The best Alaska cruise itinerary is the one that you select. So an itinerary that meets all of your exploratory and luxury needs. A small boat cruise in Alaska will provide a custom itinerary around what you want and not just what the company says you will do. Here at Custom Alaska Cruises we can customize a cruise itinerary based upon what you want to see and do. Alaska’s Inside Passage is a photographers dream. Every day brings new opportunities for amazing pictures, from wild life up close to majestic mountain scenery, from the incredible scale of the glaciers to the beautiful surreal blue ‘glow’ of the icebergs, from the ever changing light to the stunning end seemingly everlasting sunrises and sunsets you’ll never be short of subjects for your photos. 7 Day, 6 nights Alaska Small Boat Cruise Itinerary. View what makes cruising Alaska’s famous Inside Passage spectacular. 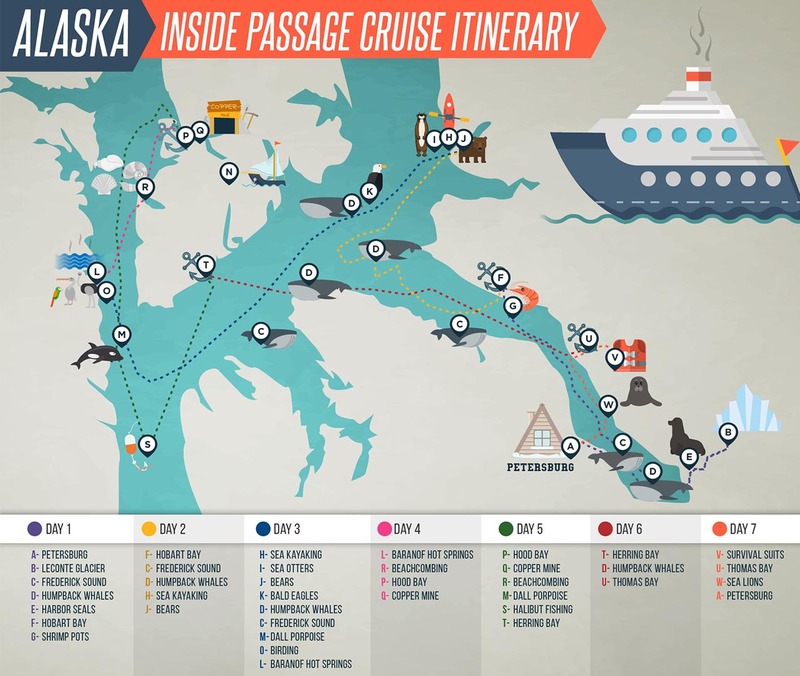 Below is a map of the Inside Passage between Juneau, Alaska and Petersburg, Alaska along with all of the cruising excursions in each location. This was written by guest and travel writer Luke Chambers based upon his 7 day Alaska cruise itinerary. Click on the titles below to view the Itinerary for that day. I fly into Petersburg the day before my cruise departs so that I will have a chance to do a little exploring in this seeming last outpost of civilization. The little Norwegian town is a great place to find interesting Alaskana and learn a little bit about the history of Southeast Alaska . While on-board our Alaska small ship cruise , the following sample itinerary below is just one of the many ways you can spend your seven day cruise. My travel arrangements call for a rendezvous aboard the Sikumi at 12:00 noon. A little bit early and am greeted by a smiling crew and captain. The steward is quick to give me a hand with my bags and show me to my room. After a quick unpacking I emerge to meet the other crew members. I grab a glass of fresh orange juice and make myself at home in the stylish salon. Over the next half hour the other five passengers make their way aboard and we all get acquainted with one another over freshly baked pastries and a truly amazing array of freshly cut fruits and vegetables. After a quick safety briefing with the captain and crew, we get underway, heading east to Leconte Glacier, one of the most anticipated stops of our entire adventure. Frederick Sound separates Petersburg from the glacier and the bay in which it lies. It is world renowned for its extremely high concentration of Humpback Whales, making it a popular destination for whale watchers. I spend some time with the captain in the wheelhouse, combing the horizons for any sign of the mammoth creatures. He explains the habits of fish that draw the whales to the sound in such high concentration as I listen intently. Much to my amusement, less than thirty minutes after leaving the dock I have my first whale sighting. Off in the distance I catch a glimpse of a tale flapping as a humpback dives deep into the ocean. The captain smiles at my excitement, as he knows how much more is to come. We make our way into a fairly narrow waterway surrounded by towering peaks. Terminal hang on many mountains as we make our up this increasingly narrow bay, toward Leconte Glacier. We see harbor seals lounging on floating pieces of ice and lying on the coast’s rocks. The floating ice gets more dense as we progress. As we round the final bend the massive tidewater glacier comes into view, and we slowly make our way to within about a quarter mile of its face. I watchfrom the front deck as huge pieces of ice, sometimes hundreds of meters across, break away from the glacier and fall into the sea. The thunderous clap of the ice and the rolling waves which it produces are astonishing. I begin to understand why we keep our distance from such towering behemoths. My fellow passengers and I return below deck to enjoy our first of many amazing meals, a pecan-encrusted halibut feast served with baked squash, homemade dinner rolls, and an amazing black cherry sauce. The on-board chef, is as hardworking as he is talented, a characteristic I will come to find in all of the crew. After hanging around the glacier for about an hour, we slowly turn around and begin heading back toward Fredrick Sound . I lounge around the salon with other passengers, enjoying a fantastic view of the glacier as we slowly retreat from it. As we return to Fredrick Sound we head north, toward Hobart Bay where we will spend our first night aboard the our boat. After pulling into this sheltered bay, we drop anchor and are treated to a wonderful dinner and a chocolate cake dessert. After dinner I find myself on the top deck, taking in my first sunset in Southeast Alaska . The captain invites me to drop a string of shrimp pots and guides me as I set them out. Later, after a few drinks and some lively discussion with my new-found friends I retire to my room for the night. The cozy bed and fine linens are quite inviting after such a lively day. After waking up on my own schedule, I treat myself to a quick shower in my own surprisingly nice bathroom. Having forgotten my own shampoo and soap, I am pleasantly surprised to find my room stocked with a very nice arrangement of soaps, shampoo and conditioner. After a glass of orange juice and a cup of coffee, I make my way to the top deck to retrieve my shrimp pots. The captain again guides me as I use a hook to grab the line of pots and the deckhand uses a winch to pull them aboard. As the pots come out of the water we all laugh with excitement, shaking shrimp after shrimp out of the pots and into a bucket. I can hardly believe the number of shrimp I have caught or the average size of them. After a light breakfast we gear up for some sea kayaking. Using a device called an aquaport, one by one we load into the kayaks and gather for our paddle. Led by our guide, we make our way along the shore and into hidden coves and bays. I am the first to notice the sea otters that have seem to taken an interest in us. They follow us as we paddle, poking their heads out of the water now and then and swimming underneath us. On the way back to the boat, we see a bear meandering along the coast. Luckily, our guide was handy with a camera and got a couple pictures. After a couple hours of leisurely paddling, we return to the boat and take up the anchor. All of the passengers, myself included, are itching to see some whales, so the captain maneuvers us into Frederick Sound where sightings are common. Snacking on the shrimp that I had caught earlier, four of us stand on the top deck, armed with binoculars and cameras when out of nowhere a whale breaches about two hundred meters off the side of the ship. This is the first of many such sightings of the afternoon. We see a couple whales in the distance bubble net feeding, and the big one that breached shows up once in a while, but never closer then the first time we saw him. As the evening sets in we retreat to a magical little niche called Hobart Bay. We drop anchor and mingle with drinks, moving between the wheelhouse, top deck, and salon. For dinner we were treated to one of the most delicious salads I have ever consumed. A wonderful mix of greens, onions, tomatoes, avocados, carrots, and roasted almonds adorn hearty chunks of teriyaki chicken kabobs, topped with a sweet cherry vinaigrette unlike any other salad dressing I have ever had. To my amazement, some of the other passengers still have enough remaining energy to climb into the skiff and go for a little exploration with the captain. I am content to relax aboard the ship, sipping wine and breathing what must be some of the cleanest air on earth. I find waking aboard the Sikumi a quite pleasurable experience, as the gentle sway of the waves calms my mind and relaxes my body. Climbing to the top deck with my coffee, I notice a bald eagle perched upon a rogue iceberg that has drifted from the glacier it was once a part of. At breakfast, the captain proposes a plan. Because the weather isn’t especially great (it’s raining, but not hard) he thinks we should cruise all the way across Frederick Sound to Baranoff Hot Springs. He imagines we will see whales along the way and hopes the weather will be nicer at Baranoff. The agreeable crowd of which I’m a part quickly concedes and soon we are motoring west, toward Baranoff. I enjoy a much deserved nap and wake to find quite a spectacle. A group of almost a dozen Dall porpoise are swimming in the bow wave of our boat, just beneath the front deck. They dart from side to side and pop out of the water, putting on quite a show. As we pass Admirality Island , the weather breaks up and we soon find ourselves basking in the sunlight. We see all sorts of shorebirds, hawks, and eagles along the shores of this huge island, which boasts one of the highest per capita grizzly populations in the world. Baranoff Hot springs is our next destination, and what a destination it would prove to be. After getting onto the little dock, I made my way past several buildings; there are a few homes here, as well as a gallery featuring some work from local artists. There is also a huge river pouring down a nearby hill. Hiking along this river with our guide and some of the other passengers, we soon find ourselves at the hot springs I have heard so much about. I just couldn’t resist and hopped right into one of the pools. Some were more reluctant then others, but soon the rest of the passengers had found their way into the water with me. Feeling greatly relaxed after my soak in the hot springs , I was looking very forward to dinner, and the chef did not disappoint. Earlier in the day he had made a point to ask all of the guests if we liked thai food, and what type of curry we enjoyed most. We all happened to be Thai enthusiasts, so we were eager to see what he was working on. After we were all seated, he presented us with spicy green Thai chicken, served with white rice and a hot cucumber salad. I don’t think there were more then thirty words said at dinner, music to any chef’s ears. Fueled by afternoon naps and a full day of excitement, I stay up with some of my fellow passengers and crew late into the night, trading stories and laughing heartily. The other passengers and I have tentatively agreed to spend part of the morning sleeping in. The laid back atmosphere and philosophy of the Sikumi and allow for such plans, so we take advantage. I wake up to find two of the other passengers chatting in the salon, snacking on the fresh watermelon, strawberries, pineapple, apple, and cherries that the chef has set out for us. I step out to the top deck for some fresh air and find the sunniest morning of the trip. I take advantage of the top deck’s sound system, plugging in my ipod and playing some of my favorite tunes as I relax with a cold beverage. We motor north for about an hour, stopping at scenic Hood Bay and dropping our anchor. As we ease into the afternoon, our guide organizes a hiking party to explore a nearby abandoned copper mine. A half hour later, our guide, two other passengers and I are cruising to shore aboard the skiff. We make our way to the beach and are soon off on our hike. We make our way inland, walking on an interestingly spongy form of vegetation known as musk keg. I am amazed at the array of wildflowers we encounter, many of which I never would have noticed without our guides direction. We walk for about half an hour before we come to the first remnants of a mining operation. I can make out some large drums and some sort building, perhaps a workshop or a small cabin. A little further along we come to the actual mineshaft, which has been blown up to prevent curious explorers from hurting themselves. Around the shaft I find all sorts of interesting stuff, from a collection of tools I don’t recognize to an eighty year old truck. After some photos of me behind the wheel, we begin our trip back to the ship. We return just in time to see one of the other passengers, fishing from the back deck of the ship, reeling in a hundred pound halibut! The deckhand is quick to cut it into neat and beautiful fillets, which the chef immediately begins preparing. Not two hours later I enjoy the fruits of my mates’ labor, happily munching on halibut tacos and drinking cold cerveza. As the night begins to set in the captain begins ferrying us to the shore to do some beachcombing and build a fire. We gather some driftwood strewn about the beach and enjoy some great fun beside the fire. I can’t help but feel like I am farther away from civilization then I have ever been before. As we get sleepy the captain takes us back to the boat, and I enjoy one of the soundest nights of sleep I have ever had. I wake up to the smell of something delicious cooking, a smell I have grown quite accustomed to. After enjoying a hearty breakfast centered around made-to-order omelets, we lift anchor and head south. Yesterday’s fishing success has piqued the excitement in all of us. Although not an avid fishermen, I look forward to trying my hand at some halibut fishing. The captain steers us south, into Frederick Sound, to a sweet little halibut hole that he knows about. We figure here we’ll be able to enjoy halibut fishing while keeping our eyes out for some whales. After helping us arrange all of our gear and showing me how to use the rod, the captain turns us loose, and within minutes a fellow fishermen is pulling a nice sized halibut out of the water. That is only the start as cries of “fish on” start coming from all sides of the boat. The deckhand and the captain can barely keep up with their nets, pulling our fish from the water. In the midst of the excitement, one of the passengers is working on her tan on the front deck, while another is playing chess with one of on the back deck. Throughout the afternoon, people are fishing, reading, playing board games, and enjoying fresh snacks such as strawberry shortcake and a baked brie concoction unlike anything I’ve ever had. For lunch, the chef fires up the grill and we enjoy handmade hamburgers and bratwurst. There is no shortage of garnish (sliced tomatoes, red and white onions, lettuce, and pickles) and the homemade coleslaw and potato salad again make me feel right at home. After catching my limit of halibut, I relax to my stateroom for a little quiet time. I lie on my bed and gather my thoughts, trying to process all of the things that I have seen and done in the last few days. Our guide leads some of the passengers on a trip to shore for some beachcombing but I elect to stay aboard the ship and relax. I have found that talking with the captain is one of my favorite things to do. His knowledge and friendly nature make him an interesting and entertaining addition to an already amazing journey, not to mention his expertise in handling the ship. When we have all finished dinner, the captain raises the anchor and we head north to Herring Bay on Admirality Island. I turn in early this evening, looking forward to a day in Frederick Sound and more chances to see whales. Dreams of the gentle giants stay with me all through the night. I begin my day with my now routine orange juice and coffee,and am excited to see that the early rising chef has once again outdone himself with homemade hot pockets and mini pancakes. Things like bacon and jalapeno cream cheese wake my sleepy taste buds up in a hurry. I am pleased to find that a fellow passenger dropped a string of shrimp pots the night before and I head to the front deck to watch as he pulls his catch from the water. Although he doesn’t end up with quite as many shrimp as I had, he does draw in some interesting catches. A little octopus and a star fish are two of the more unique things he brings up, along with another haul of shrimp, which I very much look forward to eating. While I’m relaxing in the salon with the others, the captain calls us up to deck as he spots some whales. We are really in for a treat as we make our way to the deck. Three or four huge Humpback Whales are swimming along with our boat, obviously quite interested in us. They swim no more then 100 meters off our port side, raising out of the water at quick intervals, teasing us with glimpses of their huge bodies. Once in a while we see them flap their tales as they dive deeper into the water, but they are generally staying pretty close. As I sit with the captain in the wheelhouse, he speculates that the whales may be drawn to the shape of our boats underside, or perhaps the hum of her diesel engines. Whatever the cause of their curiosity, it is clear that the whales are as interested in us as we are in them. While I’m sitting there in the wheelhouse, a monster of a whale does a full breach, maybe 100 meters straight in front of the boat. The captain and I both let out yelps of excitement, as we can hardly believe our eyes. Several other people saw the breach, and it will be the biggest topic of discussion for the remainder of our trip. As we continue on through Frederick Sound, I can’t help but feel guilty returning to the salon for some appetizers and drinks, knowing the whales are all around us.We eat fresh shrimp that the chef prepares and share our thoughts about the that we’ve all had. We make our way to Thomas Bay, located north and just across the sound from Petersburg. Just before we arrive we are treated to chicken enchiladas with black beans and Mexican rice. Of all the wonderful meals we’ve enjoyed, this is probably the most popular up to this point. We eat every enchilada the chef makes and could probably eat more. The evening is taken up with a variety of activities. I spend a good deal of the last night viewing everyone’s pictures on the on-board computer. This nifty feature makes sharing photos a snap, and our guide even helps me burn photo cd’s for the passengers and one for the boat. Some of the other passengers put on survival suits and swim around in Thomas Bay. The captain puts out the aquaport for these fun loving souls, and takes turns dragging them around the bay on surfboards behind the skiff. At the same time, our guide takes a passenger for one last quick kayak adventure. Later, I have a few casts and catch another couple halibut that the deckhand filets and packages for me to take home. After dinner everyone gathers in the salon for a drink and a good round of laughs. My eyes water more than once and my cheeks hurt from smiling before the night is through. I smile thinking about the amazing adventures I’ve been on and the wonderful people I was able to experience it with. Retreating to my stateroom, I can’t help but feel a little sad the trip is coming to an end. We are quite a distance from Petersburg, so we set off rather early, heading east all the way across Frederick Sound. The unmistakable smell of French toast rouses me a little earlier than I would have woken on my own. Sitting in the salon with the chef, I am handsomely rewarded as he heaps his homemade toast and freshly prepared strawberry syrup all over my plate. I eat until I am full, and sip my orange juice as we get underway. We are not underway long when we spot a Stellar sea lion haul out. We pause to take pictures and check the curious animals out. A short two hours later (10am)we pull into Petersburg and begin disembarking. As always,is amazing in helping us get our things together and organized.As we pull into the dock I stand on the deck, snapping the last of hundreds of pictures that I have taken over the past week. I leave the ship and take a cab that has arranged for me to the airport. I am happy and sad as I board the plane. I have a lifetime of memories fresh in my mind and an appetite for more in this last frontier.